Description: WC Northbound Freight Train passing through Pewaukee, Wi. Description: N/B freight thru Cleveland by the depot. 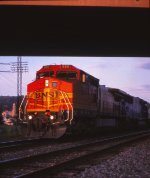 Description: 205, today led by a BNSF unit, peeks out from under the Lester Av bridge in Johnson City, catching the last rays of sun as it waits for the conductor to come up after closing up at QD. Description: Ex-Conrail SD60M and MRL SD45 lead NS 134 east through Statesville. Description: NS 277 is westbound on the Huntington District. Description: After 19G cleared CP-Easton, 24Z was given the signal to head east. By the time it passed the Phillipsburg Railroad Historians Site the train was making track speed. And the EMD was making most of the noise! Description: NS (ex-CR) SD60I still in Conrail paint with the PRR subletters being replaced by NS. Description: NS 18N approaches Still Valley Road and signal 71.1. Just missed 214 at this spot 15min. before. Description: Westbound on track two with a UP unit trailing. Description: 21M is powered by 6758, which is fast becoming an old friend, I've photographed it many times and 2524.